Welcome to Turquoise 808 D. We are honored to share our Beach Getaway located in the D Building and perched on the 8th floor of this upscale high-rise, Turquoise Place. Situated on 900 feet of pristine white sandy beach in Orange Beach, Alabama, Turquoise Place is known as the Gulf Coasts Premiere Property. Also rising above the competition, Turquoise Place offers panoramic views of the exclusive Ono Island and the surrounding beaches of Orange Beach, Gulf Shores and Perdido Key. The master suite features a King bed, a spacious bathroom with both shower and jacuzzi, and a generously sized walk-in closet. The balcony / hot tub can be reached directly from the master bedroom. The second bedroom offers a King bed and the third bedroom offers two double beds. Each guest bedroom offers its own private bathroom. There is also a Queen sofa sleeper in the living room for added convenience. Relax and soak in the amazing view from your very own hot tub located on your balcony directly overlooking the gulf. This spacious balcony is also equipped with a gas grill for your cooking pleasure. Your fully equipped kitchen includes granite counter tops, Wolf appliances, Sub Zero refrigerator, wine cooler and a Keurig machine. Don't forget to bring your laptop because 906C offers FREE WiFi and Netflix! Turquoise Place Resort sets a new standard for luxury and design. Upon your arrival you will notice the great care the housekeeping staff has taken to ensure your enjoyment. Each bed will be freshly made with fresh linens, a set of towels left in each bathroom along with a starter pack of a few items you will need during your stay. If you need to do laundry during your stay you have the added convenience of a full size washer and dryer located inside the condo. Please see the link below for our FAQ’s and helpful things to bring with you. Whether soaking in your private hot tub with a gulf front view or floating down the lazy river you'll be wondering if you can extend your stay. Thus unit is HUGE. Plenty of room to spread out and really relax without feeling right on top of each other. Grilling on the balcony was so convenient and the Hot Tub on the balcony was wonderful! Spotted some dolphins and had amazing ocean views. Would definitely book again. The condo was great, more than enough room for our family and friends. The stand-alone ice maker was not working when we arrived on Wednesday and someone was there that evening and back to fix it Thursday morning. The bathrooms, especially the master shower, had mold in the grout. This seems like an easy fix and very noticeable to the cleaning crew but looks so terrible to your visitors....Other than that we had a great stay, front desk crew at Turquoise are very nice and helpful. Hi Gay Lynn! Thank you so much for taking the time to leave us a review and give your feedback about your stay at Turquoise Place. We are glad to hear that overall you enjoyed your stay and we appreciate your feedback about showers. We take this kind of feedback very seriously and since your stay this issue has been corrected. We look forward to helping you book your next trip to the beach! Thank you, Guest Services Team at Liquid Life Vacation Rentals. Great place to stay with young kids!! We had a great experience with this property. Everything was exactly as advertised, and the whole property was very clean! The only small issue was the master bedroom tv was hard to figure out how to turn on, but we always eventually got it to work so it wasn't too big of a deal. My wife and I fell in love with the shower in the master bathroom- very nice with three different sprayers! I loved the tv in there so I could watch some football while in the shower too. We have 2 small kids and this was our first time at Turqoise Place. We will definitely be back!! Thank you for your review. We are so glad to hear that you enjoyed your stay! We look forward to helping you book your next trip to the beach. 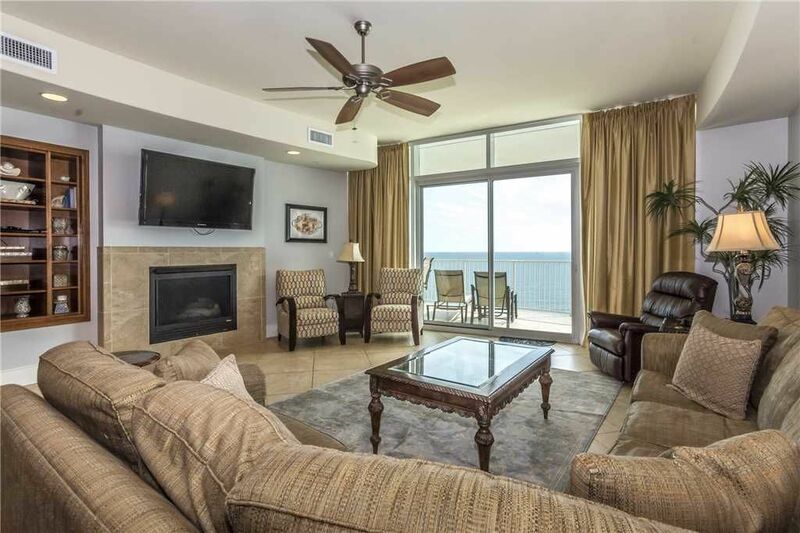 Lovely condo with comfortable beds, stunning view of the gulf. Clean. Great shower in the master with good water pressure, and plenty of hot water. TV in master bath was a nice touch. Nice deck with varied lounge chairs, table, private hot tub, and grill. Fabulous amenities. Well-appointed gym. Covered parking. Fast elevators. The staff at Liquid Life was super friendly, as was the staff at the Turquoise. Stunning condo! Exceeded all of our expectations!! Well equipped...extremely clean and beautifully decorated! Will definitely stay here again! We stayed here on our Fall Break and the experience was perfect from start to finish. We worked with Randy at Liquid Life vacation rentals and everyone there was extremely helpful. The condo had everything we needed for the week and was immaculate. I would recommend this unit to friends and in fact we have on several occasions already. Turquoise Place is located approximately 7.1 miles East of Highway 59 in Gulf Shores, Alabama.